With the Radio Amateur Callbook CD, or the Buckmaster HamCall DVD, installed on your computer, MicroLog will be able to extract name/location data for any ham in the world. The Radio Amateur Callbook CD, or the Buckmaster HamCall DVD, costs $40. You can order my new ($10) math book (Calm Down! It's Only Math), or my new ($10) learn-to-program book (Calm Down! Learn To Program), from Amazon by clicking the link above the picture or by searching Amazon for my call .. WA0H. The (free) website version of MicroLog .. can be downloaded from this website. The free website version does not have the U.S. and Canadian callbooks built into the program, nor does it allow access to commercial callsign databases, such as the Radio Amateur Callbook database or the Buckmaster HamCall database. The CD version of MicroLog .. does have recent U.S. and Canadian callbooks built into the program .. and does allow access to commercial callsign databases. 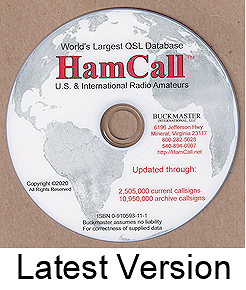 The Radio Amateur Callbook CD, or the Buckmaster HamCall DVD .. will allow MicroLog to log the name and location of hams who live outside the U.S. and Canada. These databases contain information about hams throughout the world. To purchase one or more of these programs .. select the items you want to purchase and then click the (Calculate total amount due) button. Once you have the (Total Amount Due), you can send that amount (cash or check) to Jerry Gentry at the address shown below, or you can use PayPal by clicking the PayPal (buy now) button. MicroLog will run under Windows-XP, Vista, Windows-7, Windows-8, and Windows-10. 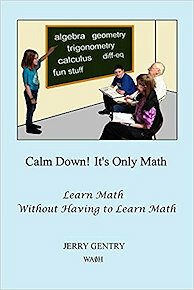 My new math book .. After 55 years of computer programming I took a break and wrote a math book called (Calm Down! It's Only Math). The book shows how you can solve many types of math problems by doing a simple internet search. It is a way to (Learn Math Without Having to Learn Math). My new learn-to-program book .. I wrote the (Calm Down! Learn To Program) book for people who want to learn how to write their own computer programs. 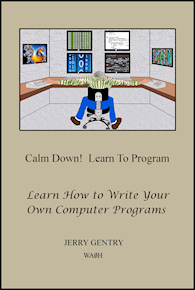 The book shows how to write computer programs that will run on a desktop or laptop computer that is running the Windows operating system.